A furnace is a device used for high-temperature heating and its name derives from the Latin word Fornax, which actually means oven. Today, the term furnace refers to the very core of a home central heating system, aka the central furnace, that is responsible for creating hot air and keeping your home nice and warm during cold winter months. What Types Of Furnaces Are There? Furnaces today come in many different types and categories. The most well-known options are electric, oil and gas furnaces. While electric and oil furnaces are still around, they are slowly becoming extinct due to the fact that they are not as economical as gas ones are. Gas furnaces utilize fossil fuel to transfer heat and are considered the most economical method of heating available today. Essentially, this type of furnace converts gas into heat by using burners, heat exchangers and blowers. Note: Gas furnaces are the most economical because the price of natural gas in Ontario is quite low in comparison to electric or oil. Ground Source Heat Pumps are the most efficient source of heat commercially available but have prohibitive installation costs making natural gas, once again the most economical. A single stage furnace is the kind of furnace that supports only one type of operation – an on and off operation. It works with a gas valve that can either be opened or closed and its flow of gas occurs at only one rate – high. The main cons to this type of furnace are that it lacks control, as well as that it’s not as efficient as other modern-day options (it operates at around 80 percent annual fuel utilization efficiency). The main pro to the single stage furnace is that the installation cost is much lower. The two-stage furnace is the type of furnace that can be controlled with two settings: low or high. That not only allows the user to control the temperature in the house but is also a lot quieter than single stage furnaces. This heating system is capable of communicating with thermostats and can adjust its performance accordingly. The possible downside to it is that the air moves at a slower pace. A modulating furnace adjusts the heating output and speed more precisely and in coordination with the outside temperature. It is also one of the most energy-efficient options available and keeps the circulation of air continuous, even after the heating process has stopped. Modulating furnaces are definitely the best solution to keep you warm and cozy during those extremely cold winters. A modulating furnace can initially cost initially cost more to install but can save a lot of money in the long run. Obsolete Low-Efficiency Furnace – Operates at 55% to 72% AFUE and is considered out-of-date technology. Low-Efficiency Furnace – Operates at 78% AFUE and is the minimum required AFUE allowed for new furnaces. Mid-Efficiency Gas Furnace – Operates at 80% AFUE. 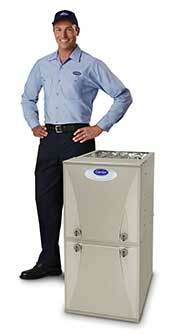 High-Efficiency Gas Furnace – Which operates at 90% to 98% AFUE. In Ontario today, only High-Efficiency furnaces are allowed to be installed. Although there are still many of the lower efficiency styles of furnaces in operation, any new furnace must be at least 90% efficient (AFUE). The main job of a furnace is to keep a house warm and cozy during cold winter days, both to keep you comfortable and to keep your water pipes from freezing. This system does so by utilizing each component in the most convenient and efficient way possible. The most common heating setup today is the one including a thermostat which constantly reads the air temperature and regulates it accordingly by sending signals to the furnace that then increases or decreases the heat. Once the thermostat detects that the air temperature is dropping below the desired level, it activates the furnace. The gas valve opens and ignites the burner component beneath the combustion chamber. If you’ve ever heard your furnace make a clicking sound, that is when the fuel is supplied to the burner for a controlled flame and when a heat exchanger device starts working by warming the air. When the exchanger reaches the operating temperature, this warm air is pushed forward and the blower motor starts working to circulate the air throughout the various vents in your home to provide you with heat. Once a desired level of heat is generated, the thermostat shuts off the heater. Renting A Furnace vs Buying A Furnace – Which Is A Better Option? If you’re thinking of replacing your HVAC system with a more efficient one, one thing you will have to consider is whether renting a furnace or buying a furnace is a better option for you. While buying a furnace does increase the value of your home and gives full autonomy over the unit, furnace rental is becoming more popular each year and listed below are just a few reasons why. By renting a furnace, you remove most of the risks associated with owning a heating system. Since an HVAC company, such as Enersure, retains ownership of the system, it is in the company’s best interest to keep it running properly, so all the maintenance, repairs and services are included in your rental fee. Besides having no repair costs, another benefit of furnace rental over buying is that there are no upfront expenses. Buying a furnace costs you anywhere from $4000 to $7000, which is a number too high for most homeowners. You will only have one number to call. Rental companies generally have staff on hand 24 hours a day to service your equipment. You will not have to make several phone calls trying to find a qualified company to agree to service your equipment in a timely manner. The furnace rental cost depends on the type of furnace and your home’s square footage, but our rental costs start at only $49 per month and include full installation and 24/7 coverage. For more information on furnace rental and furnace rental costs, click here or contact us now!